I know you can set the DHCP scope but is there a way to set the lease time? No, there is not an option to set the lease time. Out of curiosity, why are you wanting to be able to configure that? I know the reasons for having lease times but those really only seem applicable in larger business environments. Just curious why that feature isn't exposed. I am looking for a way to limit connections given our low bandwidth Comcast connection. 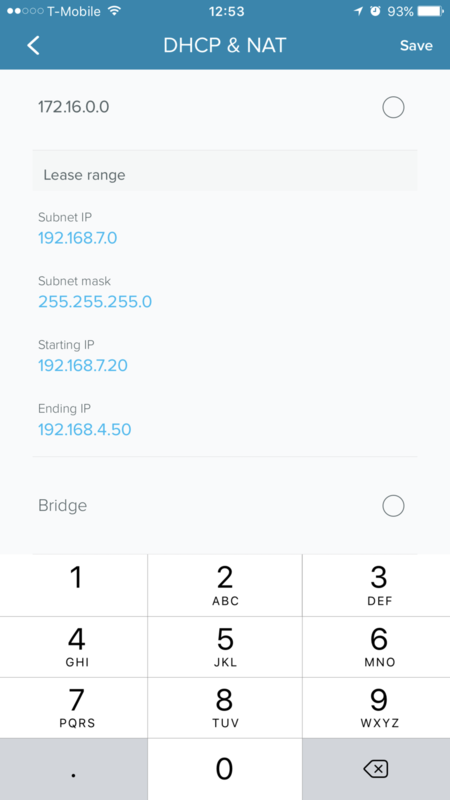 One option is a small DHCP scope to limit the connection count and a short lease to release unused IPs. This is for a small church. We have a 3 services, so most attendees are using the connection for 2 hrs or so and then leave. You can narrow the scope in Menu => Network Settings => Advanced Settings => DHCP & NAT by scrolling down to "Lease range" and modifying the Start and End IPs as I have done in the attached screenshot. The client lease time is four hours by default (which may meet your needs) but we haven't exposed a way to modify it. Once the four hours is up and if the address is no longer in use, it will return to the lease pool.